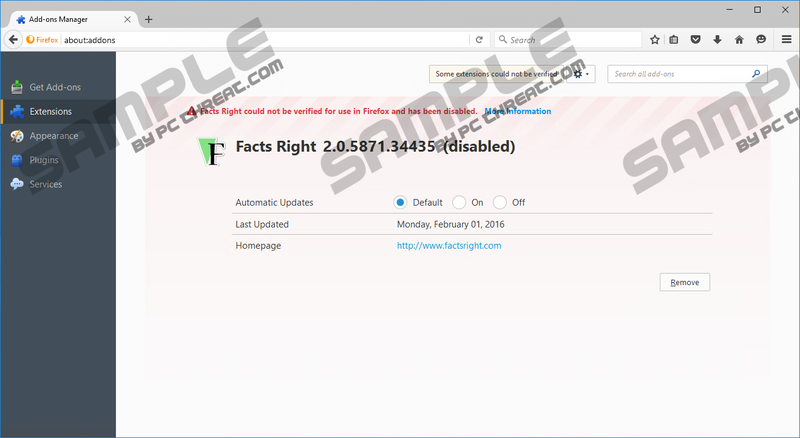 Facts Right is a new application that falls under the category of adware. This program works rather differently than one would imagine as instead of providing you with interesting facts it gathers the information about you. Mainly, this program settles on the Internet Explorer or Mozilla Firefox browsers and generates pop-ups with ads while you search the Internet. Based on the information gathered about you, it will provide targeted ads that you might be tempted to open. However, we advise you to stay away from the content displayed by this adware, because you might harm your computer or expose your private information. To learn more, you should continue reading this article. If you decide to remove this program from your computer, you can use our recommended steps to guide you through the process. Facts Right is not unique in any way as it has numerous clones, such as Triangle Trail, Glass Bottle, On Stage, Strong Signal, etc. If you check the Facts Right files you can see that Leto Elite signs their Digital Signature. This company has released many potentially unwanted programs (PUP) and adware applications that were created not as useful tools for the user, but as a way to make money from user’s browsing. Therefore, we have no reason to believe that this application is any different. Moreover, if you have Facts Right on your system, it is possible that there are even more adware or other malware programs installed. It is very likely because this program comes bundled with the malicious installers, meaning that it settles on your computer along with other possible infections. So you might see ads generated by different applications and other malware symptoms. There is an easy way to check what adware is installed on your computer. Most of the ads display “Powered by” or similar lines on the ad, so look for possible titles on the ad itself. Many users download bundled malicious installers while getting free applications from suspicious websites. That is why it is so important to avoid file-sharing pages that offer free programs, especially if your computer is not protected by a Firewall or an antimalware tool, as they would notify you before entering an untrustworthy page. Facts Right’s primary activity is advertising numerous products through various types of pop-ups and links. That is why it will continuously display ads that will be based on your latest search results or the bought goods. How does it know what you buy or what you are interested in? Apparently, it gathers your browsing and shopping information that some users would consider private. This program creates a particular Windows Registry entry in the DOMStorage key that is used by Internet Explorer. To be more precise, it is a particular Internet Explorer tool that works in a similar manner as HTML Cookies. The main difference is that DOMStorage allows gathering a bigger amount of information and for much longer period. According to the picked up information, Facts Right provides you with Third Party ads or links to their websites. While doing so, with each pop-up or sponsored link it advertises a particular Third Party and helps it increase its website’s traffic. From every click the Facts Right creators receive advertising revenue. It would seem that everyone gets something useful from this, but not you. On the contrary, the experience with this program might become very unpleasant. Besides generating money for application’s originators, these ads also redirect you to suspicious websites that might promote fake products and have harmful content like viruses or worms. So you might catch more serious infections if you click on such pop-ups. This advertising content might be displayed as banners, full page ads, video ads, etc. Probably it will present attractive deals that would help you save some money, but users cannot recognize which ad is reliable and which one is fake. We see no reason you should leave such an application on your computer, especially when one can find various shopping offers or sales directly on reliable e-shops. Facts Right ads might seem tempting, but consider the possible threats and think whether it is worth keeping it just to save some money. Therefore, we urge you to remove this useless adware from your system with the instructions below the article. If you follow these removal steps carefully, you should have no trouble deleting Facts Right. Though, if some parts seem a little bit tricky, you can contact us via social media (Facebook, Twitter, Google+, and YouTube) or leave us a comment here. Go to the Start menu and pick Control Panel. Choose the program and click Uninstall. Find the application and pick Uninstall. Click on the settings icon on the top-right corner. Open Manage add-ons and choose Toolbars and extensions. %SystemRoot%\Prefetch\FACTS RIGHT.EXE-[any number of symbols].pf. Locate Facts Right folders or files and right-click on it to delete them. Repeat the same to remove remaining Facts Right shortcuts from these locations: %ALLUSERSPROFILE%\Start Menu\Programs\Facts Right.lnk. Quick & tested solution for Facts Right removal.